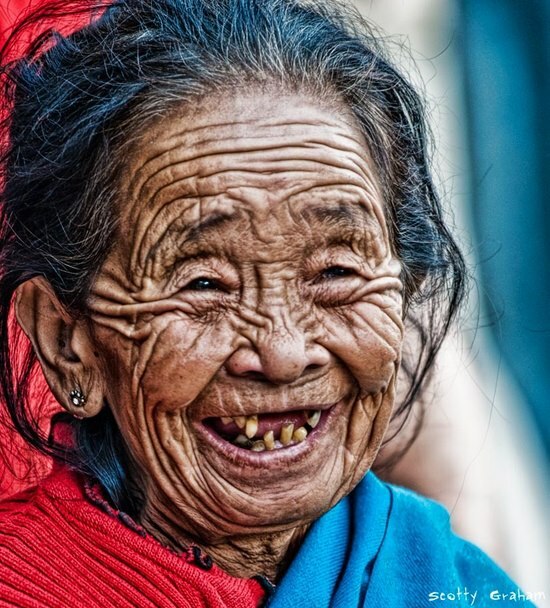 The smiling woman from Kathmandu is a stunning microcosm of the shifting sands of time at the top of the page. Many of us often think of an hour-glass when picturing “the sands of time,” as time was once measured by the slow drip of sand through a small pinch-point in a glass container. When comparing the effect that time has had on this woman’s face to its effect on the natural landscape of our earth, it’s hard to overlook the similarities: the shadows and light, the peaks and valleys. These are etched across her face as much as they make up the shifting sands of a desert over time. Times of goodness: light and peaks in life are inter-connected to times of troubles: shadows found in the valleys across both the woman’s face and the sandy landscape. As we become Refined by Age,™ these life experiences become as much a part of each human being’s “landscape” as the wind becomes part of the earth’s landscape. Life experiences, like the wind, leave their mark and move on. In each is a beauty to behold – a tale of solid, fluidity: body and spirit, sand and wind. Kathy… a moving piece of writing expressing the beauty of time and life experience over one’s life span. A treasured experience denied to many. Thank you, Lori, for the kind comment, and for being open to the synchronicity that nurtured this new beginning for me.